Layered beadwork really gives a 3D look to designs. 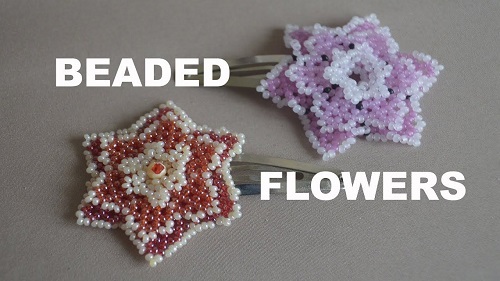 I also like this simple layered beaded flower tutorial by Beading and Miroslava TV because of its versatility. You can use it for hair clips as shown in the picture. Or add a brooch pin behind the flower. Adding a loop at the top would turn it into a necklace. The designer also mentioned using it as a focal for a bracelet. Only 11/0 beads are needed. The designer not only edged the petals with a contrast color but shows an option to add a strong contrast color subtly. See those black beads in the purple and white flower? That is what I mean. A small detail but it does make the design pop! The pattern is in 2 sections.